A Blackhawk helicopter in a search of Waterville Valley. If nowhere is a place where no one has trod for decades, then Mount Kancamagus is in the middle of it. A hiker found himself there last week on what the Appalachian Mountain Club’s White Mountain Guide describes as a “trail-less mass of round, wooded ridges” and where he stumbled upon human remains. Several law enforcement officials returned with the man the next day to retrieve them and earlier this week, dental records confirmed that they were those of Steven Romines, a Massachusetts man who went missing almost 20 years ago, in October of 1984. Investigators say initial reports had indicated that he was “distraught” at the time and while no cause of death was determined, it is likely that he committed suicide. “From where the location was, he was off the beaten path,” said State Police Lt. John Scarinza, commander of Troop F in Twin Mountain. The discovery of and subsequent age of the remains was a bit of a wonder and a reminder of the secrets the mountains keep and sometimes reveal in their own due time. New Hampshire may be a small state and ‘sprawl’ might be a buzzword in some parts of it, but there are places here where people get lost. Sometimes they are never found. Last week’s recovery is certainly not the first time remains have been discovered after a significant length of time has passed. Ten years ago, hikers on the Valley Way trail in Randolph discovered the remains of a Massachusetts woman. The Valley Way, the most direct and easiest trail to the AMC’s Madison Hut, is a popular route. According to newspaper accounts, her remains were found no more than 75 feet off the trail. She had been reported missing nine years before. State Police Sgt. Bob Bruno can understand how difficult it is to find someone who wanted to be lost. He hiked up Mount Kancamagus last weekend. And even when they got to the top of one of the ridges where the hiker took a GPS reading after discovering the bones, Bruno said they did not find them right away. “Even with sophisticated equipment, we couldn’t find it,” he said. Local police say they get several calls a year from relatives reporting that loved ones may have headed for the mountains intending to end their lives. Veteran officers who have dealt with these situations say in such stressful moments, people return to an area where they had once found happiness or other spiritual reasons. There is no list, per se, of people believed missing in the White Mountains. Bruno, a 24-year veteran of State Police, figured the remains he helped retrieve last week were either Romines or another man who had been reported missing years before. The remains were not of the young man who went missing in 1983 from Franconia Notch. He is a mountain statistic whose fate has yet unfolded in more than 20 years. Michael Miller was 23 in 1983, up with friends from the Massachusetts Institute of Technology for an October weekend. On that particular Sunday, according to newspaper accounts, he shouted “See you at the summit” to a group of friends and departed up the Old Bridle Path on Mount Lafayette. It was 3 p.m. on that day, far too late to consider summitting the 5,260-foot mountain. He wore jeans, boots and a leather jacket over a sweater. A search that lasted nearly a week followed, in weather conditions that deteriorated, as they do rapidly in the approach to winter. On the last day, winds howled at hurricane force. To this day, nothing indicating what might have happened to him as ever been found. “It happens,” said Grafton County Sheriff Charlie Barry, a former director of the state’s Fish and Game Department. One of his most puzzling cases happened more than 30 years ago. “Her name was Ethel Conners and she and her husband – they were both in their 80s – lived in Plymouth,” he recalled. One night, they took a ride up to a house they owned on Swain Hill in the Glencliff area of Warren. He started mowing the lawn. She changed her shoes and told him she was going to take a walk up the road. “He kept mowing and when he finished, she never showed up,” Barry said. What followed was a massive search of the area, involving scores of people. Barry spent time in a helicopter searching from the air. Volunteers did line searches along the side of the road, in case she had been struck by a car and thrown into the woods. A case as puzzling as the Conners disappearance has been shaping up in the woods of Haverhill, where Maura Murray, a Massachusetts nursing student, was last seen following a minor car accident in February. Air and ground searches have failed to turn up any clues. It has not only been people whose fates have been concealed by the mountains. In the past five decades, at least three planes had disappeared and were not discovered for lengthy periods of time. The most recent, and perplexing, mystery was the Learjet that went missing out of Lebanon on Christmas Eve 1996. Unequipped with a locator device that would likely have denoted where it went down, the jet was found by Orford forester Quentin Mack in a depression on Smart’s Mountain in Dorchester. It was missing for almost three years, despite intensive searches in the years that followed. Mack told investigators that he had been within 100 yards of the crash site the week before. That was the case in this area. There was no trail leading to the site – getting there involved about 45 minutes of bushwhacking through over some challenging terrain, but a little more than half a mile off a well-maintained logging road. 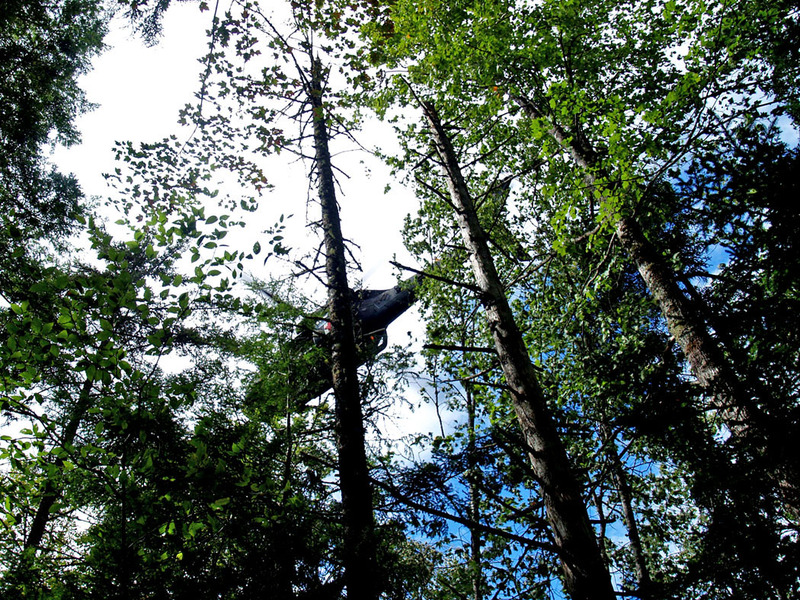 The Learjet was not the only aircraft crash in New Hampshire that went undiscovered. In June 1972, a hiker on Jennings Peak in Waterville Valley discovered the wreckage, and the body of the Iowa pilot still strapped inside, of a Cessna. It had been missing since March 1966. “It had been bound for Maine from Burlington, Vt.,” said Paul Leavitt, the assistant Grafton County Sheriff, who was the Waterville Valley police chief at the time. He described the crash area as heavily wooded. The most fabled lost plane went down in February 1959, when two doctors on the staff of the Dartmouth Medical College were returning from an emergency in Berlin aboard a Piper Comanche. That plane was missing for more than 80 days, recalled Barry, who was a young conservation officer at the time and had participated in the extensive search. It was finally discovered that May, after a plane went up on a search. It had gone down in the remote Pemigewasset wilderness, about 12 miles north from Lincoln and about nine miles off the Kancamagus Highway. “The snow had melted and you could see it right from the air – it was upside down,” Barry said. It was later found that the two doctors had survived for several days after the crash and had left notes for their families. There is other lore in these mountain places of people who went missing and were later found. Some has been lost in time, the legends outliving the archival knowledge of people who knew about it. One of those legends comes out of the little town of Easton. In a slim volume of the town’s history published in 1976, Looking Back at Easton tells the curious story of a Morman settlement in the Easton Valley, on the slopes of Mount Kinsman. It was surmised that these settlers had gone west where their leader, Joseph Smith, was establishing a home for the Church of the Latter Day Saints, according to the Easton history. Robert Frost, who lived for several years in neighboring Franconia, immortalized the story in a poem, A Fountain, A Bottle, A Donkey’s Ears and Some Books. In it, Frost is badgering a local man to take him to the ruins of the settlement. “Not so, but I can find it. Historians have determined some family names associated with the stories about the Mormons, including the name Cooley. I read this today, and thought it worth reblogging. Sam. Haven’t heard from you in a while. Its almost to the point that I wonder if _you_ are missing. It is possible you may have decided to go Grizzley Adams for a while to persue the case further. Just run off into the mountains and…whatever. Joined the freegans or went on a mission in Amsterdam with the Raelians. I just don’t know. But there is one thing I do know….and its that the Internet will find Sam Ledyard.